A PA Arab farmer admits that he and left-wing groups falsely accused Jews of burning his sheep alive. The truth: He lost control of a brush fire. A Jordan Valley Arab farmer has exposed the tactic of leftists accepting Arab claims and falsely accusing Jews of attacking Arabs. He admitted that the “burning sheep” libel against Jews was meant to disguise his own blunder of losing control of a brush fire. Last week, left-wing groups in Israel and counterparts in the United States spread a story that that an Arab shepherd “saw settlers light a fire in the field where his herd was grazing, burning to death 12 pregnant ewes, and then drive away." The story of the sheep burning was so extreme that the police immediately doubted the claim. The supposed burning of the sheep occurred on the Sabbath, when observant Jews, the usual scapegoats, are forbidden to drive. 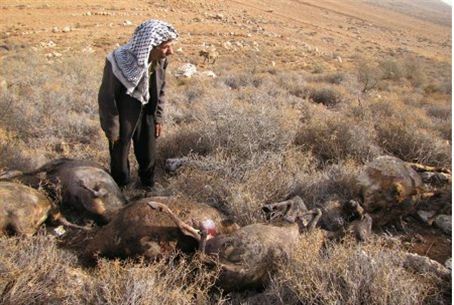 The Arab farmer, Samir Bani Fadel, claimed that four armed Jews approached him, chased him away, set fire to his field – which also is forbidden on Sabbath – and drove away as the fire spread and burned to death 12 pregnant ewes while injuring others. Regardless of the doubts, the left-wing B'Tselem and Yesh Din human rights group rushed to allege that the supposed attack was another one of hundreds of supposed acts of vandalism by Jews against Arabs. New York-based writer Philip Weiss promptly reprinted the libel on his Mondoweiss blog, and the image of sheep being cruelly burned aroused sympathy for Arabs and anger against Jews. “It was an awful sight,” the farmer said. "I've lost at least $12,000." The tale began to unravel when Arabs pointed their fingers at residents of Itamar, an easy target as it is a religious community, but located almost an hour’s drive from the scene of the fire. The story then was changed, with the blame being placed on the closer community of Maaleh Ephraim, most of whose residents are professionals and who almost never have been accused of any activities against Arabs. Fadel finally admitted to police the whole story was a lie and that he was responsible for the fire, which he set to burn thorns before it spread beyond control. Blaming Jews not only would have saved him from the embarrassment of having burned his own sheep, it also would allow him to claim damages from the government while being hailed as a hero among Palestinian Authority Arabs and left-wing anti-Zionists. Hundreds of accusations against Jewish residents of Judea and Samaria have been leveled in recent years, usually in claims that Jews attack or destroy olive trees, although evidence has been produced that in most cases the Arabs have simply pruned their trees, counted on lack of agricultural knowledge on the part of the media and leftwing groups, and then accused Jews of damaging them. Olive trees look hacked when they are pruned and months later, the supposedly damaged orchards have been seen to be full of fruit. Another tactic has been to instigate violence, especially on the Shabbat when Jews are forbidden to take pictures, and then accuse Jews of attacking them. Dagan explained that Jews are blamed for burning cars in Arab villages when in fact they are damaged as a result of fights among Arabs. David Ha’Ivri, who heads the Shomron (Samaria) Liaison Office that handles public relations for the Jewish communities in Samaria, said, "We have a very difficult task up against a bunch of well-funded NGOs like B’Tselem and Rabbis for Human Rights, whose agenda is to hurt the image of the State of Israel and the Jewish residents of Yehuda and Shomron (Judea and Samaria).